This simple assembly of ingredients can be used as an appetizer if you are serving a crowd or can be served with a nice veggie and good grain to complete a nice dinner. Either way, it is simple, unique, healthy and delicious! 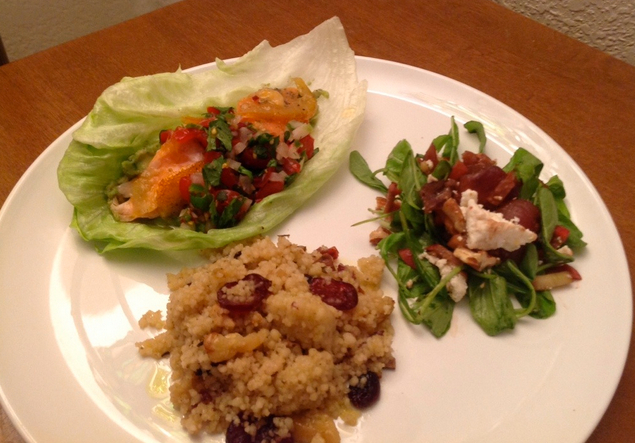 I simply filled some nice crisp endive leaves with ceviche for one version and baked salmon for the second version. For the ceviche, I made the easiest preparation choice; bought it at Groomer’s! For the salmon, also from Groomer’s, I simply seasoned the filet with garlic salt and pepper and spread a thin layer of TE mustard seeds on top. I then baked it at 350 for 15 minutes. To assemble, I filled half of the leaves with ceviche and topped them avocado and a healthy dollop of TE mustard seeds. For the salmon, I filled the other half of the leaves I had with the salmon; topped that with a pico de gallo I made using radishes in place of onions and perfected the pile with a spoonful of TE oranges. The result is in the photo above. I decided to make it a meal, so I added a nice cous cous and a salad with arugula, pickled beets, pecans, goat cheese and used the TE onions as a dressing. It was a hit with my crew.